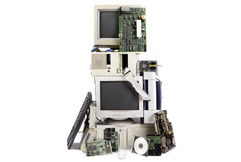 We Purchase E-Waste and Electronic Recyclables! R.S. Davis Recycling, Inc. purchases the following Electronic Recyclables at its headquarters in Clackamas, OR: Computers (Desktops) and Laptops, circuit boards, RAM (memory), Network Cards, Networking & Satellite Equipment, Telecommunication Equipment, Gold Memory, Silver Memory, cell phones with battery and cell phones without batteries, Hard Drives whole and with boards, Hard Drives without boards, Li-Ion Laptop Batteries, Li-Ion Cell Phone Batteries, and Server’s. Data Secure Process: R.S. Davis Recycling, Inc.’s process ensures your data is safe and secure. Personal Computers and Laptops are dismantled onsite, under the watchful eye of our state of the art camera system. Hard drives are removed from the computers manually & indoors in our designated dismantling area, and then destroyed by removing the hard drive board from the hard drive itself, rendering the hard drive inoperable. Destroyed hard drives are then stored indoors under lock and key, and monitored via camera as well as outside security system and patrol during non-business hours, until the remaining pieces of the hard drive are sent onto to our downstream partners for ultimate destruction via shredding. Dropoff: R.S. Davis Recycling, Inc.’s Clackamas location is able to purchase electronic recyclables during normal business hours. If you have a large amount of material (more than a pickup load) we ask that you call for an appointment so that we are able to quickly grade your material and ensure your trip is efficient for you and our team – 503-655-5433. Specialty Sorts: If you have a wide variety of material that requires more time to sort (such as many different types of processors), we will ask that you leave the material so that we can grade it at a later time as to not back up our scales. Please feel free to call for details on this service – 503-655-5433 – ask for Nicole or Hank. Industrial & Business Accounts – Please call Hank at 503-655-5433, or email and we will give you a call! Business, Industrial & Household Electronics Recycling – “Oregon E-Cycles” = Free Drop Off! Monitors – TV’s – Desktop Printers – Keyboards – Mice = Free Drop Off! We currently accept specific electronics as part of the “Oregon E-Cycles” program. You can bring in up to seven monitors, TVs, desktop printers, keyboards or mice (regardless of brand, age or working condition) and we’ll make sure they’re recycled in an environmentally responsible way. To schedule drop-off for more than seven items, contact Nicole or Joe at 503-655-5433.